Arnold Dreyblatt, the Berlin-based media artist and composer, is currently teaching as Professor of Media Art at the Muthesius Kunsthochschule in Kiel. 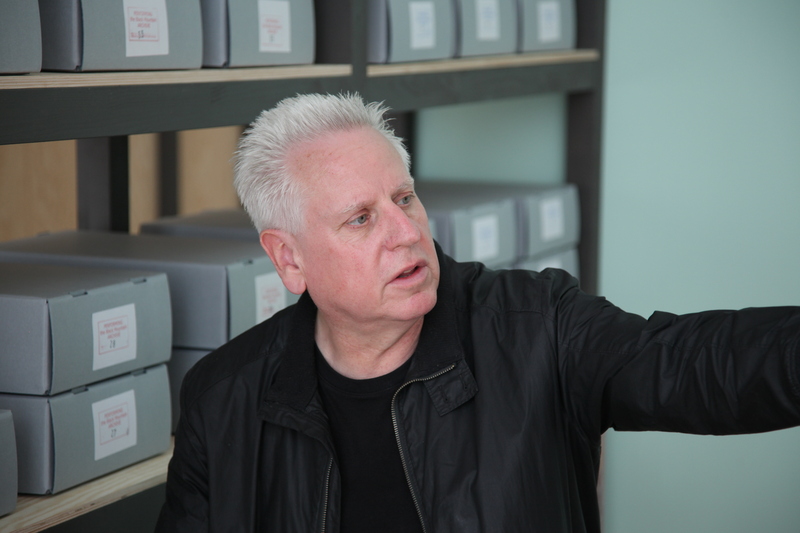 Combining both abilities, Dreyblatt developed the artistic project Performing the Black Mountain Archive, which accompanies the exhibition Black Mountain. An interdisciplinary experiment 1933 – 1957 (05.06.-27.09.2015) at Hamburger Bahnhof – Museum für Gegenwart – Berlin. The project incorporates the live performance of archival material Dreyblatt collected in the Black Mountain Archives in the United States. Dreyblatt invited students from ten European art academies – amongst them his own class – who present the material in the form of readings, concerts and performances over the entire duration of the exhibition. Including students from different disciplines like sculpture, painting, media art, sound art, music, dance, theater, typography and literature, the project investigates the interdisciplinarity of Black Mountain’s pedagogical approach. Verena Kittel from Black Mountain Research spoke to Arnold Dreyblatt about the concept behind Performing the Black Mountain Archive, the artist’s personal interest in Black Mountain College, the project’s relationship to an aesthetic of reenactment as well as its impact on contemporary art, research and education. Black Mountain Research: Arnold Dreyblatt, you created the project “Performing the Black Mountain Archive”, in which students from ten art colleges’ present selected archival documents, literary texts and artistic scores within the Black Mountain exhibition at Hamburger Bahnhof Museum für Gegenwart – Berlin, following a concept you developed specifically for these readings. Could you tell me a bit more about the concept? Prof. Arnold Dreyblatt: “Performing the Black Mountain Archive” comprises an on-site artistic residency which incorporates the live performance of archival material as readings, concerts and performances within a pre-planned time structure at pre-determined locations. In ‘Performing the Black Mountain Archive’ ten art academies participate for a one to two-week period during which students are in residence within an Archive / Studio space. In reflecting the interdisciplinary nature of education at Black Mountain, students from sculpture, painting, media art, sound art, music, dance, theater and literature have been invited. The Archive / Studio functions as the home station for the project, containing a working area for the students and the site of the Archive itself. Within the Studio area, students are visibly present during opening hours, pursuing artistic work and research. The students have access to the entire archive contents, which include not only the material used in the performances, but all archival documents which have been collected by the artist. The live event periods take place from 11:00-13:00 and 15:00-17:00. Resident students are involved in their own artistic research in the Archive / Studio Space when not actively performing and are encouraged to be present on-site during museum opening times. As event moments occur according the score, students take the pre-selected archive files (or other materials) and proceed to the pre-selected event area shortly before the active event moment. During the pre-determined time bracket, the student reads / performs / or otherwise carries out the planned activity for the duration, and, upon completion proceeds back to the Archive / Studio Space when he or she returns the materials to the archive. The performative periods are indicated yet the specific times and locations of events are not specified. This ensures that the public discovers the live performances only as they navigate the exhibition. BMR: How does this possibly involve an aesthetic of reenactment? AD: The project is not a ‘reenactment’ in a literal sense, since it does not involve the re-staging of historical performative works. On the other hand, my work has always been concerned with the visualization or re-vitalization of dormant archival materials. A live performance in the form of readings by contemporary students in the arts represents a ritual and public interaction with the past. The essence of “Performing the Black Mountain Archive” ocurrs in this encounter, in which we re-experience and re-utilize the legacy of Black Mountain in a confrontation and a meeting between student, public and archive. BMR: What was the initial starting point, the criteria, for “Performing the Black Mountain Archive”? AD: In early 2014, the curators of “Black Mountain. An interdisciplinary experiment 1933 – 1957” presented plans for a future exhibition at the Hamburger Bahnhof and invited me to propose an artistic contribution utilizing archival materials. My initial research generated innumerable questions: How may we now, from our vantage point in 2015, understand and re-activate the legacy of Black Mountain College, to ‘make it new’ in a participatory sense? Is the creation of a space for open experimentation and interdisciplinary interaction between the arts and the sciences relevant for contemporary discurs? Might we re-examine the context in which art is taught and communicated at the sites of display and education? As an artist and educator, I suggested that the historical exhibition would include the participation of students from contemporary sites of art education in the creation of an active and living performative archive. “Performing the Black Mountain Archive” comprises an on-site artistic residency which incorporates the live performance of archival material as readings, concerts and performances within a pre-planned time structure at pre-determined locations. The diversity of activities and personalities at Black Mountain provide a fertile reservoir for the development of individual and group projects, both for public performances and for artistic research. Ofri Lapid working on “Performing the Black Mountain Archive” at Arnold Dreyblatt’s studio in Berlin. Anna Schapiro, Project Coordinator, at Arnold Dreyblatt’s studio in Berlin. BMR: What interests you personally in Black Mountain College? AD: When the college closed in 1957, due to a drop in student numbers and a lack of funds, many of the teachers and students moved to New York City and made their mark on the city’s future cultural life. Having been personally nurtured within the downtown New York City art and performance sphere during the late 1960’s and early 1970’s, and having pursued an interdisciplinary art practice, it has been a revelation to discover how the later traces of the Black Mountain legacy may have served as inspiration and catalyst within my own artistic biography. Futhermore, having been based in Berlin for over thirty years, the extent to which the tragic events in 1933 (including the closing of the Bauhaus), directly supplied important intellectuals to the College in its early years is both ironic and surprising. BMR: In order to find, collect and select the materials used in the project you visited the most important Black Mountain Archives in the United States. Which strategy did you pursue to view and select the documents, records and interviews? AD: In my selection of texts for performance according to the score, I have attempted a comprehensive mosaic of thematic elements, which span from the chronic of day-to-day activities and discussions to accounts of what in hindsight were major artistic developments and events. In the United States, and to some degree in Europe as well, what is known about Black Mountain is often restricted to the famous summer academies during the post-war period, and to those individuals who later achieved fame in the international artworld. I have felt strongely that it is important to sample events, indivduals and themes from the totality of the college’s history, in order to comprehend the internal struggles and interdisciplinary discourse which seem so relevant for us today. BMR: Besides working as an artist, you are also teaching as Professor of Media Art at the Muthesius Kunsthochschule in Kiel. In your opinion, does the model of Black Mountain College have a potential in contemporary art education? AD: Black Mountain College was inherently an interdisciplinary environment, in which material and content often resonated across artistic medias in an exchange with the natural and hard sciences. Social and existential needs precipitated practical solutions, which resulted in student and faculty participation in construction, farming and collective administration. While the term ‘experiment’ seems today to infer incompletion and failure, its persistent use in relation to Black Mountain might be better understood in reference to its latin root experimentum, as a trial, in relation to experience. Former students and faculty recall that while the college from its very inception actively dispensed with many of the structures which one associates with a normative academic institution, participants demonstrated an unusual intensity of personal committment and responsibility. Regardless if one experienced the pre- or post- war period at the college, an exposure often permanently changed lives. BMR: The Black Mountain exhibition at Hamburger Bahnhof is primarily research-based. How will your “Performing the Black Mountain Archive” relate to the rest of the exhibition? AD: When I was asked by the curators to develop an artistic project for the exhibition period, it was clear the exhibition would rely chiefly on archival material. I felt instinctively that the involvement of students in the arts would be essential in counteracting a nostalgia for an exemplary pedagogical and social experiment. It is important to emphasize, that it is not only the public which confronts the material during the ‘live’ performative moments, but also, and perhaps more importantly, the students themselves. Additionally, the inclusion of a student functioning Atelier/Studio within the exhibition is clearly a political statement on its own. My project thereby attempts to insert the performative present within a setting which celebrates the past. It is my hope that “Performing the BMC Archive” will complement the exhibition in unexpected ways. BMR: In what way do you consider “Performing the Black Mountain Archive” a contribution to current discourses about art and art education? AD: Both the exhibition and the placement of my artistic project within it pose essential questions on the nature of art education today. Founded on John Dewey’s reformist principles of education, Black Mountain College represented an ongoing dialog in which the institutional, philosophical and pedagogical aspects of education were continually re-examined and “put to the test”, and where the teaching of the arts functioned within a broad intellectual context in geographical isolation. Frequent discussions about structure and content often resulted in enormous upheaval and conflict, yet it is precisely this discurs which is so pertinent and necessary today. BMR: You will need to rely on different students each week. What role does trust play in this collective practice? AD: There are certainly enormous risks in a project such as this. As the artist who developed this concept and who has a particular vision as to how the project will be performed, I must accept unforseen developments, both problematic and revelatory. An even greater trust exists on the part of the museum, a state institution which operates according to agreed upon rules and traditions, which now must accept and foster a living and working situation with students which functioning daily within the exhibition. We agree that the students will take possession of the studio area, often with as yet uncharted goals. We trust that the students will carry out their work in the spirit of my project, the exhibition and the college itself. There will clearly be misunderstandings and discussions, but here again we are mirroring the fluid nature of Black Mountain College as an institution, which was never static. BMR: What role does interdisciplinarity play in your project and how does this potentially have an impact on art and/as research and education? AD: In my experience in New York in the 70’s and 80’s, there was an intensive interaction between the arts which made a strong impression on me and which has informed my artistic development and interests to this day. Ironically we still experience segregation of disciplines in the academies, as if the many historical examples (not only at Black Mountain) of interdisciplinary research and education artistic interchange had never taken place. Not only within the visual arts, but between the fine arts and the time-based and performative arts, there is often not only an unbreachable chasm, but also an ignorance due the segmented nature of arts education today. I therefore find it extremely important that the interdisciplinary nature of BMC is reflected in both the exhibition and in my choice of archival material for “Performing the Black Mountain Archive”.